Hello and welcome to another edition of ‘Live Blogging on Shish on Baseball’. Tonight it is Arizona Diamondbacks taking on Pittsburgh Pirates. The Diamondbacks are coming off dropping 2 out of 3 from the Cubs. While the Pirates took 2 out of 3 from the Giants. Tonight’s Starting Pitchers are a pair of right-handers. Zack Goldey for the Diamondbacks and Joe Musgrove for the Pirates. 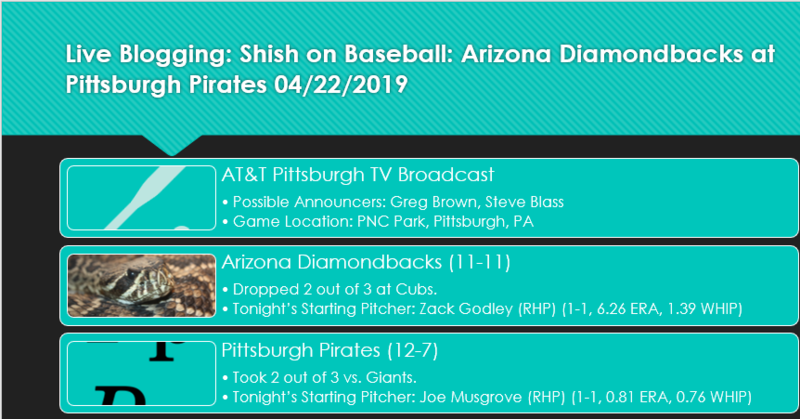 It is Arizona Diamondbacks and Pittsburgh Pirates, coming up shortly..
Hello and welcome to another edition of ‘Live Blogging on Shish on Baseball’. 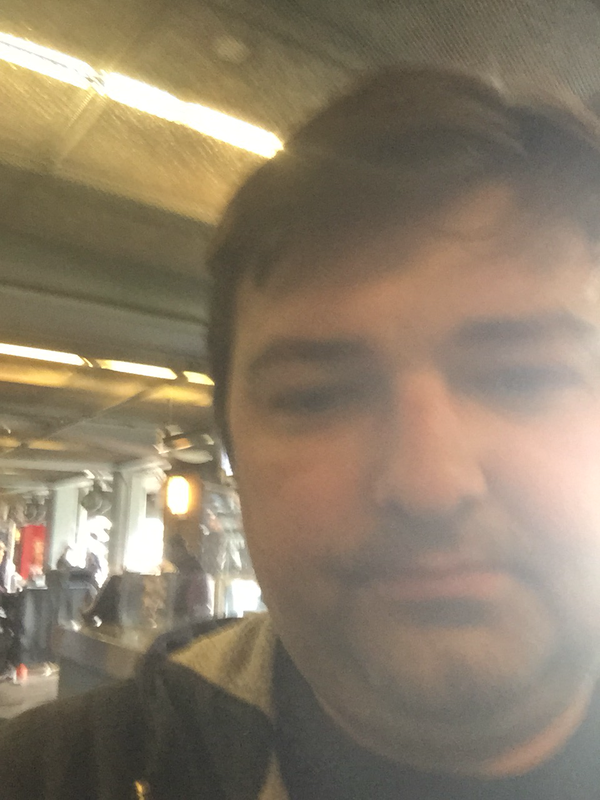 Tonight ‘Live Blogging on Shish on Baseball’, will be on the Main Page of Shish on Sports website. Tonight’s game is between Toronto Blue Jays and Minnesota Twins. Tonight's Starting Pitchers are right-hander Matt Shoemaker for the Jays. And left-hander Martin Perez for the Twins. It is Toronto Blue Jays and Minnesota Twins, on now. Hello and welcome to another edition of ‘Live Blogging on Shish on College Basketball’. 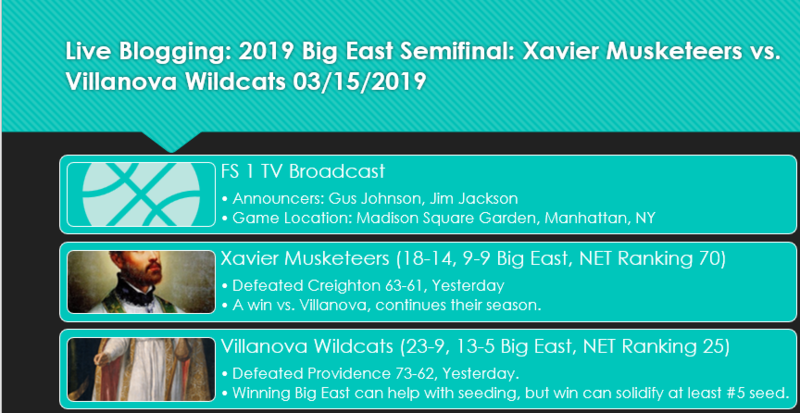 Tonight it is a Big East Semifinal against Xavier Musketeers and Villanova Wildcats. This is a more important game for Xavier, as they are fighting to keep their season. A win tonight and tomorrow, and they will be in the NCAA MBK Tournament. As for the Wildcats, they would like to get the Big East Tournament Crown, to pad their dominance in the 2nd version of this conference. The Musketeers are led by Naji Marshall in scoring. Tyrique Jones leads Xavier in rebounding. While Quentin Goodin leads the team in assists. Their team stats include a scoring average of 72.0 PPG, while allowing 70.6 PPG. They rebound the ball at 36.1 RPG. And they distribute the ball at 14.6 APG. For the Wildcats, they are led by Phil Booth in scoring and assists. While Eric Paschall leads Villanova in rebounding. As for their team stats, they are scoring at 74.6 PPG, while allowing 66.9 PPG. They rebound the ball at 35.2 RPG. And they distribute the ball at 14.2 APG. It is Xavier Musketeers and Villanova Wildcats, coming up shortly. Hello and welcome to another edition of ‘Live Blogging on Shish on College Basketball’. Tonight it is a Big East Clash between Butler Bulldogs and St. John’s Red Storm. This is an important game for both programs, as they are fighting for their NCAA MBK Tournament. lives. The Bulldogs are led by Kamar Baldwin in scoring. J. Tucker leads Butler in rebounding. And A. Thompson leads the team in assists. For their team stats, they average 72.8 PPG, while allowing 68.6 PPG. They rebound at 32.4 RPG. Finally they distribute the ball 13.6 APG. As for the Red Storm, they are led by Shamorie Ponds in scoring and assists. And LJ Figuero leads Chris Mullen’s St. John’s Squad in rebounding. Their team stats include, a scoring average of 79.7 PPG, while allowing 73.5 PPG. They rebound the ball at 33.8 RPG. And they distribute the ball at 14.9 APG. It is Butler Bulldogs taking on St. John’s Red Storm, coming up shortly.